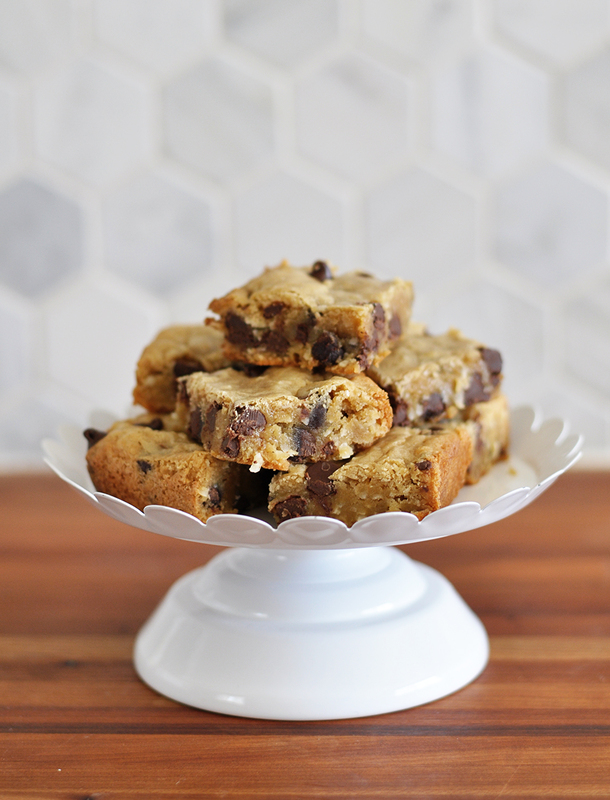 Dark Chocolate Chip Coconut Blondies - Real life, on purpose. Six or seven years ago…maybe longer…our friend Lydia and her husband invited David and I over for dinner and a movie. I’m not 100% sure on this point, but I think that was the night we watched this non-canon James Bond farce. It’s not relevant, but maybe you should watch it because it is BIZARRE. 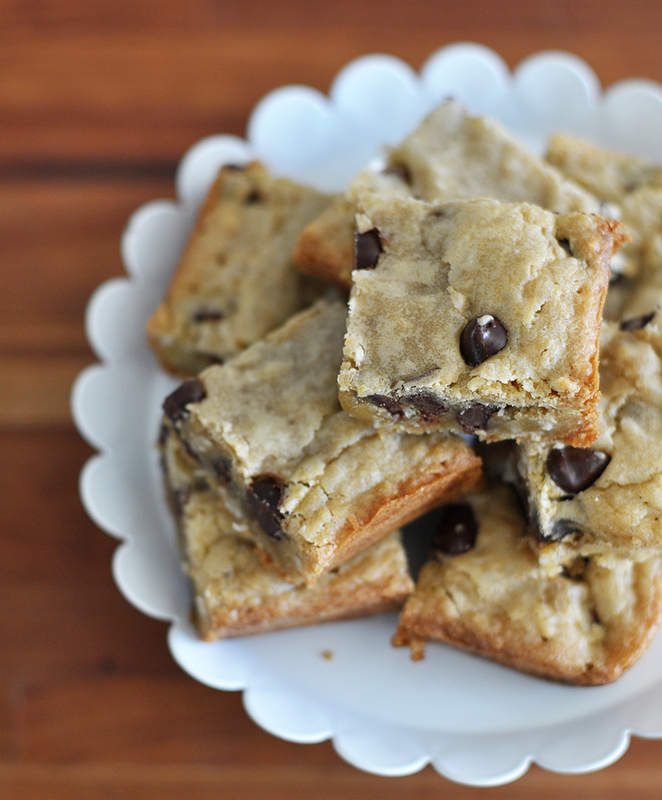 After dinner, we started the movie while Lydia whipped up a batch of dark chocolate chip coconut blondies. When they were done + had cooled a bit, she brought over a plate full. We ate every last crumb. I’m not exaggerating at all. Between the four of us, we polished the whole batch off. Lucky for us, they didn’t judge us for being dessert hogs and we are still friends. (Love you guys!) Luckier still, she shared the recipe with me. I’ve made a batch at least once every few months for, well, probably seven years now. 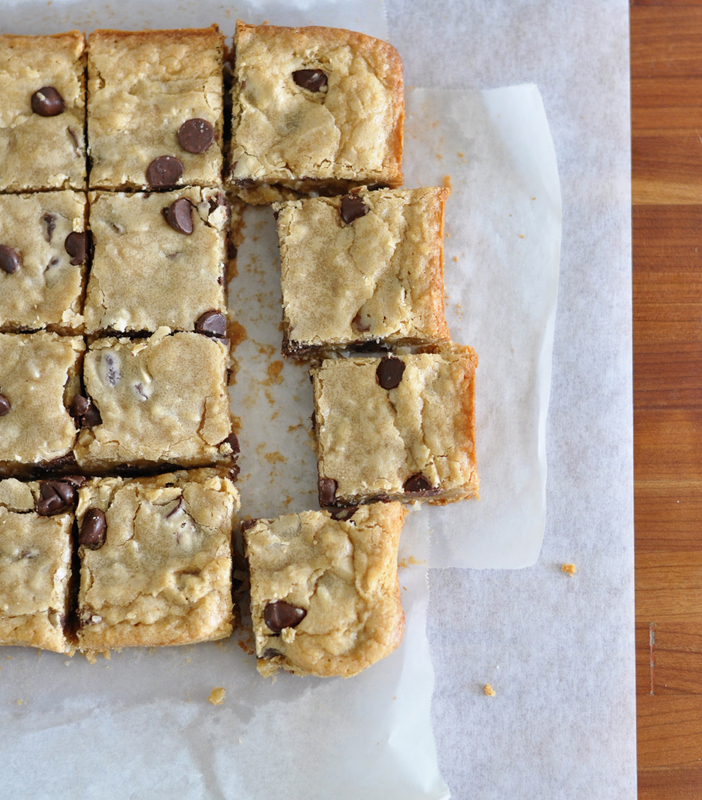 That’s a lot of dark chocolate chip coconut blondies. This is my go-to dessert. They come together quickly with just one bowl + one spoon. The ingredient list is simple and I almost always have everything on hand. The recipe is easily adaptable, too. I’ve used peanut butter chips or butterscotch ones, with or without the dark chocolate and/or coconut. Now that I’m thinking about possibilities, I want to try some with white chocolate chips and macadamia nuts. That would be heavenly. And, since you already know I can’t resist these things, I’ll confess: I ate three squares after taking these photos. Be impressed that I waited that long before diving in. Preheat oven to 350°F. In a medium bowl, stir together butter and brown sugar. Add egg and vanilla; beat until smooth. Stir in flour and salt until just combined. Mix in dark chocolate chips and coconut. Press evenly into an 8×8 baking pan* (batter will be thick and sticky). Bake for 22-25 minutes, or until set and edges are golden brown. Cool slightly before serving. *I’ve successfully used lots of different pans for this, including 8″ round cake pans, a tart pan, and ramekins for individual servings. Be sure to decrease baking time if you do that. I have also doubled this recipe and used a 9×13 pan, simply increasing the baking time by a few minutes. Also, the amount of butter in the recipe is usually sufficient to keep the blondies from sticking to the pan. If you are concerned about sticking (my 8×8 pan is old and sticky, which is why I use a lot of other pans instead) line with parchment to make removal easier, or butter the baking pan before pressing the batter in. So I made these and have sworn to never make them again… they are too good! I doubled the recipe and substituted half the butter for coconut oil and I also did half flour/half almond flour. I’ve eaten half the tray by myself. With each bite I say, “Okay, no more.” But I know I’m lying to myself 😆. Seriously, thank you for sharing this delicious goodness! Saaaaame. I cannot be trusted around these things. I’m so glad you enjoyed them too!